Conveniently Assembled Terrarium All-In-One Starter Kit H Potter terrarium planting kit. H Potter has assembled a complete kit for planting your new glass plant terrarium. You receive the following items each individually packed in a canvas reusable bag: pea gravel, activated charcoal, and soil. No need to search out all the things you need to create your very own terrarium garden. ORDERING AN H POTTER TERRARIUM, SEE RECOMMENDED SIZE BELOW: Order H Potter Planting Kit Medium when ordering SKU: WAR142 and WAR143. Order H Potter Terrarium Planting Kit Large when ordering SKU: WAR105, WAR117, WAR150, or WAR153. SKU number is listed on terrarium's product page. 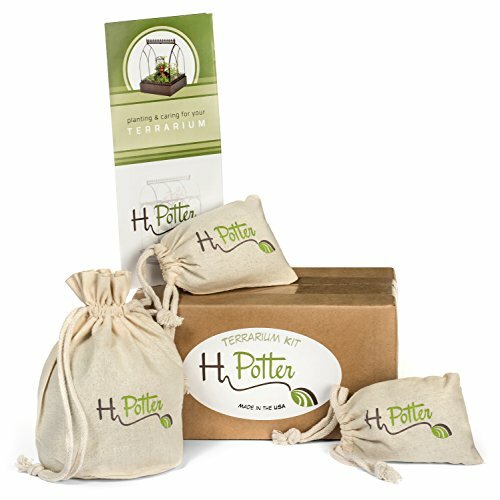 H Potter presents their new premium terrarium planting kit, offering everything a terrarium builder needs in one complete starter kit. Gift box and canvas bags create a beautiful gift. Small Terrarium Kit includes the following supplies: pea gravel (approximately 11 oz), activated charcoal (approximately 1.5 oz), and soil (approximately 7 oz), along with detailed planting and care instructions. Everything you need to create your own miniature garden arrives in one box. This small terrarium kit is designed to fit H Potter ® terrariums SKUs 65-1R, 65-7R, WAR146, WAR147, WAR148 and WAR151, if you are using another container please refer to our terrarium sizes for a comparison. A medium and large terrarium planting kit are also available from H Potter. Made in the USA by H Potter, continually bringing you high quality products designed to last.